27.03.2014 - 9pm at "Loop" in Vienna. 29.03.2014 - 2pm at "Jazz Klub Cekaonica" in Belgrade, Serbia. 29.03.2014 - 10pm at "IZBA" in Novi Sad, Serbia. 30.03.2014 - noon at "Banat Blues Cafe" in Crepaja, Serbia. 30.03.2014 - 9pm at "Kruna&Cactus" in Pancevo, Serbia. 03.04.2014 - 8pm at "Wirr" in Vienna. 25.02.2014 at Cafe "Fellin" in Viljandi. 28.02.2014 at "NO99" in Tallinn. 01.03.2014 at "Philly Joe's Jazz Club" in Tallinn. 02.03.2014 at "Voffka Club" in Sillamäe. 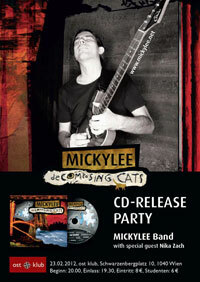 We will play the music from "deComposing Cats" and couple of other tunes as well. I'm very much looking forward to this one! 06.03.2014 at "Die Ausstellung" in Vienna. 19.03.2014 at "Smaragd" in Linz. Other dates are coming up as well, so stay tuned! Dont't miss this one, it's going to be a lot of fun! I'm so excited to announce my new project called "Daily Solo"! I will be posting one solo every day to my youtube channel. You can also like the Facebook page where I'll post all the updates regarding the "Daily Solo". I'm very much looking forward to your feedback! 13.01.2013 at Vienna Globe Trampers. Jazzbransch with Hans Schön, feat. Ivan Ristanovic as special guest. Start at 11am! 15.01.2013 at Cafe Epicur in Klosterneuburg. Duo, start at 7.30pm. 17.01.2013 at Cafe Carina in Vienna. Duo, start at 9pm. 19.01.2013 at eMCe Plac in Velenje, Slovenia. Duo, start at 9pm. I´m very excited about the two gigs I´m going to be playing in Belgrade at Jazz Club Cekaonica on November 13th and at the Novi Sad Jazz Festival on November 14th! For the small annual fee you can download tons of high quality music sheets, with almost every possible instrumentation. The owner of the company is a very cool guy, called Fabrizio Ferrari, who will help you with all the questions you might have regarding the music on the site. He also runs one of the greatest communities for the musicians on the web, called Musicians Page. There you can sign in and make your music profile for the other colleagues to see. Also, there are music jobs posted daily! CHECK IT OUT! June 7th 2012 at Satchmo Jazz Club in Maribor, Slovenia. Start at 9:30pm. June 8th 2012 at eMCe Plac in Velenje, Slovenia. Start at 9pm. On June 9th and 10th I´ll be teaching at the new and exciting 2012 at NYC Jazz-Workshop in Mattighofen with Andy Middleton, Martin Reiter, Chanda Rule, Raphael Preuschl and Gernot Bernroider. There are still couple of places available so hurry up and book it, it´s going to be lots of fun! We are also going to play a concert with my music on 9th of June (venue to be announced) which I´m really thrilled about! June 15th 2012 at Kulturzentrum in Mattersburg with Jazzbransch. Start at 8pm. June 16th 2012 at Unplugged in Vienna with Matthias Schneider Band. Start at 9pm. June 24th 2012 at Vienna Globe Trampers Headquarter with Hans Schön´s Jazzbransch. 11am-14pm. June 30th 2012 in Klosterneuburg with Inspirational Corner. May 17th 2012 at Tunnel Vienna with Inspirational Corner. Start at 9pm. May 22nd 2012 at Musikwerkstatt Wels. MICKYLEE Band with special guest Aaron Thier on drums! Start at 8pm. May 30th 2012 at Fledermaus Wien with Inspirational Corner, featuring Big John on vocals. Start at 10pm. May 31st 2012 at Capatosta Wien with Inspirational Corner (trio). Start at 9pm. May 7th 2012 at Shrinenyc. from 9pm until 10pm. May 8th 2012 at SOMETHIN´ jazz club. from 9pm until 10:45pm. If you are around, check it out! On 23.02.2012 in OSTKLUB at 8pm. Don´t miss this great opportunity to hear the new music LIVE! We are going to be supported by the great fusion band from Belgrade, Serbia GISMAJES! I´m looking forward to seeing you all there! 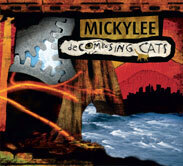 I´m proud to announce that my album deComposing Cats is available for purchase! Currently you can buy it exclusively through this website. The price of the CD is 14€ plus postage. Please, CONTACT me for further details. In the meantime, you can listen to the samples on the AUDIO page.